Casting has just been announced for the Tour of the Jersey Boys which kicks off in Birmingham on 16th December. Michael Watson will be playing Frankie Valli, Simon Bailey will be Tommy De Vito, Declan Egan will be Bob Gaudio and Lewis Griffiths will be Nick Massi. 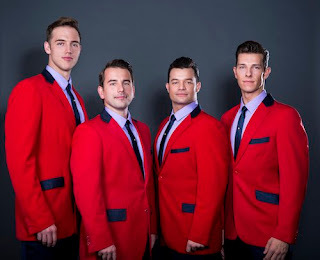 Michael, Simon, Declan and Lewis have all previously performed their roles in JERSEY BOYS to great acclaim: Michael and Simon in the West End, Declan in the West End and Australia, and Lewis in the first UK and Ireland tour. Dayle Hodge will return to the production to play Frankie Valli at certain performances.